"Magritte and Contemporary Art" is on view at the Los Angeles County Museum of Art through March 4, 2007. Besides being included in this exhibit, John Baldessari helped design it. The homage to Magritte is apparent in the way that he, too, hides his subject's identity. 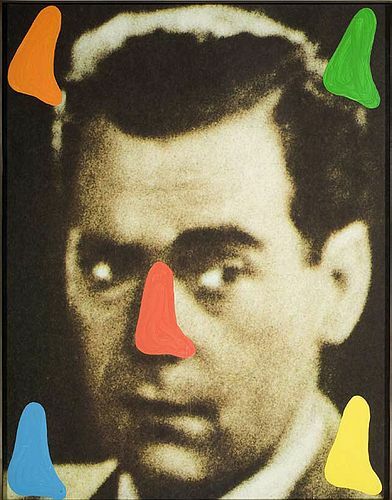 Whereas Magritte might have someone turn away, Baldessari in the 1980s painted circles over faces in the news photographs or old movie stills in his work. The noses seen here are a variation on that idea, with different colors so the viewer can imagine the subject in different moods (red for dangerous, blue for hopeful, etc.). It's all pretty crude, and intentionally so. The photo reproduction is grainy, the painting amateurish; even the moods are color-coded cliches. Baldessari is associated with Conceptual Art, a misnomer or, at any rate, ironic because it implies intellectual elitism. He likes pictures that are "dumb," he says. Art should be "mute and stupid and not about parading . . . virtuosity."